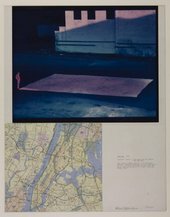 This In Focus explores Oppenheim’s Salt Flat through the systems aesthetics of critic Jack Burnham, showing how the artist’s seemingly straightforward action of spreading salt on a parking lot and its deadpan documentation are in fact part of a complex system. In 1968 Dennis Oppenheim spread one thousand pounds (454 kilograms) of salt into a large rectangle on an asphalt parking lot in Manhattan, recording his action in what he called a documentation and naming both parts of the work Salt Flat. While many critics initially interpreted Salt Flat as an example of the indexicality that characterised contemporary land art, conceptual art and performance, others, like Jack Burnham, were more interested in how the work created a system that encompassed social, cultural and natural phenomena. This study considers the wealth of art historical sources that Salt Flat makes reference to and subverts. It investigates the Manhattan parking lot where Oppenheim created the work and its shifting status as a site of urban decay and renewal, and examines the echo of colonial salt production in the act of raking salt. It interprets the work’s creation as a process of negation and reads it through the lens of philosopher Michel Foucault’s notion of the heterotopia – a site that converges with and inverts conceptually linked spaces. Published in November 2017, the project is authored by John R. Blakinger (University of Southern California) with contributions by James Nisbet (University of California, Irvine) and Randall Edwards (City University of New York).